Price was great and close to where I was visiting that night. The hotel staff was very rude and ignored my husband and I on both occasions when we stopped by the front desk to check-in and out. Housekeeping did not speak english and would not stop knocking on the door. No "do not disturb" sign. Closeness to place I was doing business. Hotel staff was very rude, and unhelpful. Rent a room if that is all you need, a bed and bathroom. Those are nice but that is all there is. No room service, smaller than expected. Tiny pool that wasn't worth having. This hotel appears to have been converted from something else in the past. The elevator is in what appears to have been a doorway, which looks very odd. There are *no* sliding doors at the front, which means you have to carry your luggage in while holding the door open, not ADA compliant at all. The swimming pool also has serious ventilation issues. The 79-room Fairfield Inn by Marriott Indianapolis NW offers economically priced accommodation for both the business and leisure traveler. The three-story, non-smoking hotel has one 400 square-foot room available for business or social functions. Items included with the room rate are a hot breakfast buffet, high-speed Internet access, parking, local telephone calls and coffee available in the lobby 24/7. There are three golf courses a short drive from the property. Area attractions and landmarks include the Indianapolis Motor Speedway, the Childrens Museum, Eagle Creek State Park, Indianapolis Convention Center, the Indiana State Fairgrounds and the Fashion Mall at Keystone at the Crossing. All the guestrooms have a work desk with high-speed Internet access, telephone with voicemail and speakerphone, coffee and tea making facilities, cable television with news and movie channels, pullout sofa bed, iron and ironing board, alarm clock and a hairdryer. Some rooms have a microwave oven. The hotel has an indoor swimming pool and whirlpool. There are two fitness centers a short drive from the property. The complimentary breakfast is the only meal served here but there are several places to eat nearby including a Chilis, Longhorn Steakhouse, Macaroni Grill and Teds Montana Grill. The 24-hour front desk has safe deposit boxes, information on area events and attractions and a list of restaurants that will deliver to the inn. Other amenities include fax and copying services, valet-dry cleaning and a coin-operated laundry. 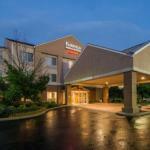 The complaints about outdated and musty rooms have stopped since this Fairfield Inn has undergone a major refurbishment. Hopefully those who said they would try another neighboring hotels might be tempted back. Among the new additions here are king suites, large flat screen televisions and a 24-hour Express Market which offers a wide range of snacks, sandwiches and beverages. The inn has also expanded its complimentary breakfast with a larger selection of hot and cold items. The great location is unchanged, within walking distance of shops and restaurants.